They rose to the challenge! Ombud’s Corner: At cross purposes? A PhD student working on the ATLAS experiment has created a replica of the Large Hadron Collider using Lego building blocks. Nathan Readioff, from the University of Liverpool (see here), submitted his design to Lego Ideas (see here) this week and is now awaiting the 10,000 votes needed for it to qualify for the Lego Review, which decides if projects become new Lego products. You can help this project, vote online now! A computer simulation of the miniature Lego LHC, complete with four detectors connected with blue dipole magnets. His Lego design is a stylised model of the LHC, showcasing the four main detectors ALICE, ATLAS, CMS and LHCb at the micro scale. Each detector is small enough to fit in the palm of your hand, yet the details of the internal systems are intricate, revealed by cutaway walls. Every major detector component is represented by a Lego piece. The models are not strictly to scale with one another, but the same size base is used for each one to maximise the detail that can be included and give a more uniform look to the set. 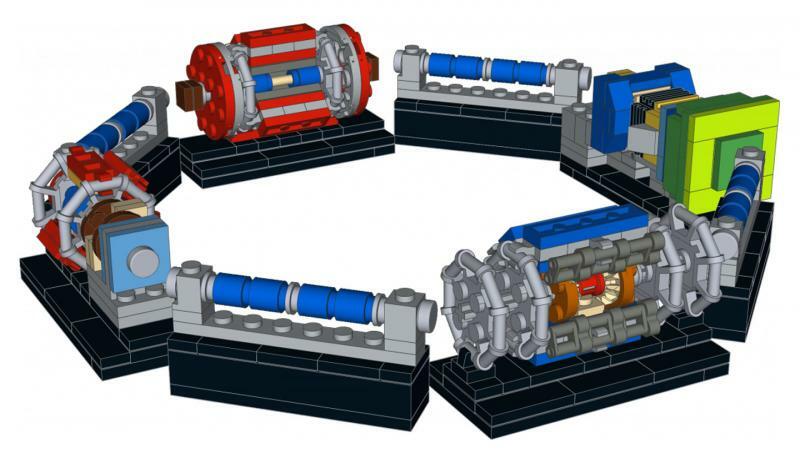 While working on a sample prototype of the Lego LHC, Readioff says he learned a surprising amount about CERN and the various detectors himself. “I understood ATLAS because that’s the experiment I work on, but I knew almost nothing about the other detectors,” he says. Readioff researched the other detectors, and learned how they share the same basic features – silicon detectors, calorimeters, muon chambers – and yet use vastly different technologies and designs to achieve their goals. Besides the detectors, he says, he also learned how to assemble a robust Lego model and to question the designs recommended by a computer simulation. “The first draft model of the ALICE detector was designed on a computer; it took me two hours to get the bricks to hold together and it would shatter at the slightest touch,” says Readioff. His final design replica is made to be robust, with parts that hold together well, helping the Lego builder to construct each detector within minutes. If you want to build your own miniature LHC now, you can do so using the complete instruction manuals and part lists already available on the “Build your own particle detector” website. To vote for Readioff's Lego LHC design, register with Lego Ideas and click the “Support” button on the Lego LHC page.